Have you heard of the black sheep issue in Switzerland? If not, then go to BBC News website to have a quick overview. 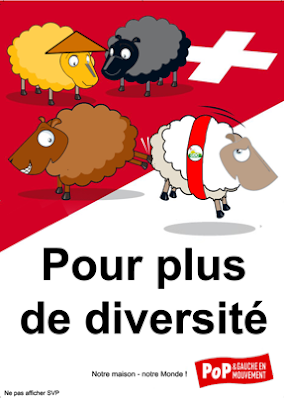 The biggest political party in Switzerland, UDC, has put some controversial ads showing white sheep (Swiss citizens) and black sheep (foreigners who commit crimes). I think you can imagine the confusion regarding the meaning of such a poster. However, the main goal of UDC is achieved. People write about them. Although this post is a good example of how UDC succeeded (since I am writing about them), it is not aimed at discussing political issues. The next picture shows the trends of three political parties in Switzerland around the date when the ad was displayed. 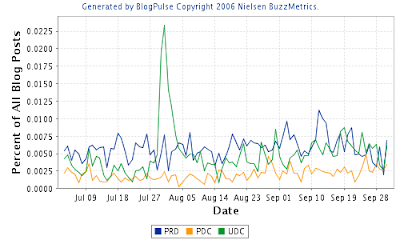 The peak shows that people more often use the word UDC the day the campaign poster is released. As usual with such data, they have to be interpreted carefully. Words such as UDC, PRD and PDC could have other meaning among the web. This post has a discussion of such data interpretation issues. Please add our website to your blog. If you want to advertise on Data Mining Research, I think the easiest is to use TextLinkAds and find my blog there. Please add my blog. I have data mining career opportunities posted there. Really nice job. Well done!